Federal and state agencies hope a more cooperative effort emerged from the Midwestern floods of last year; an effort that will help communities recover sooner. Missourians remember the widespread and devastating floods of 1993 and 1995. Northeast Missourians remember being hit hard last year when floodwaters in Iowa traveled down the Mississippi and swamped towns along the way. Federal and state officials have been meeting ever since that devastating flooding of a year ago, attempting to find non-structural approaches to flood management. "So that if there was an area that could be taken out of danger and homes re-located if necessary and the floodplain managed in a way that it would minimize risk to people and property, then we were going to try to do that," according to Bob Anderson with the US Army Corps of Engineers . The Corps, the Federal Emergency Management Agency , the Natural Resources Conservation Service as well as other federal agencies have been meeting with state agencies from various Midwestern states for the past 11 months. The regional Interagency Levee Task Force held its final meeting in St. Louis, though there is talk of continuing the effort to bring various agencies together to not just prepare to fight flooding, but to help devastated communities recover. Anderson says the task force is focusing on non-structural approaches so it can combat flooding other than building more and higher levees. He says everyone working on the task force understands that whether federal or state, they all need to work better together. "That’s one of the things we’ve really been working on this last year to improve, just communication, sitting down together and saying, ‘Well, let’s look at this as a total package rather than as individual agencies,’" says Anderson. Anderson says cooperation is vital in helping communities wrecked by flooding recover. Much attention this year was focused on northeast Missouri when floodwaters from Iowa flowed into the Mississippi and topped levees north of St. Louis. But an official with the Army Corps of Engineers says flooding has been widespread in Missouri for the past two years. Chief Emergency Manager Jud Kneuvean with the Army Corps of Engineers Kansas City office says Missouri barely escaped a re-enactment of one of the worst disasters in state history: the flood of 1993. Many parts of Missouri have experienced their wettest year on record. St. Louis reports a record precipitation so far of 55 inches; records dating back to 1870. The previous record was 1982. 1993 now ranks third in St. Louis. Kneuvean says much was learned in the wake of the great flood of 1993. Kneuvean says many have overlooked the widespread flooding in Missouri the past two years, flooding which has caused $24 million in damage. A winter of work remains as the Army Corps of Engineers tries to fix what floodwaters broke this past spring. It wasn’t the flood of ’93, but don’t tell that to residents of northeast Missouri who lost homes, businesses and an entire crop season due to the Easter floods of 2008. Rain swollen rivers up north fed into the Mississippi which kept rising, overtopping and destroying levees from the tip of northeast Missouri to St. Louis. The US Army Corps of Engineers estimates floodwaters this past spring did $25 million damage in the St. Louis District alone. Flood damage was much more extensive and expensive up north in the Rock Island District, which includes the tip of northeast Missouri as well as much of Iowa that suffered severely from flooding. Representatives of the Corps and other federal agencies met in at the State Emergency Management Agency headquarters in Jefferson City Tuesday. The Regional Interagency Levee Task Force is composed of several federal agencies as well as representatives from Missouri, Iowa, Illinois, Indiana and Wisconsin. Though the flooding devastated the Mississippi River levee system, Corps of Engineers Major Jason Taliaferro in the St. Louis District says the levees didn’t fail. Taliaferro says the levees held until floodwaters kept rising too high, overtopped them and, finally, breached them. Federal funding for repairs has been secured. Matching grants also have been secured. Taliaferro is confident the work will be completed in time for farmers to get into the fields next spring. Lincoln County is getting an extra $1.4 million in federal aid to repair levees damaged by flooding in June and July. The governor’s office has announced the award which is in addition to the $6 million given the state by the US Army Corps of Engineers for levee repair in the county. The new money comes in the form of Community Development Block Grant (CDBG) funds which will be spread among four levee districts and two drainage districts. 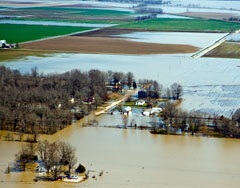 Next time, the US Army Corps of Engineers might allow farmland to be flooded, on purpose. The Corps has devised a plan to prevent the massive flooding that took out cities and towns, wiped out crops and devastated the upper Mississippi River earlier this year. The plan would cost $3.7 billion. It would have to be approved and funded by Congress to take effect. The plan would construct stronger and higher levees to protect the cities along the upper Mississippi. It also would buy out farmland that would be allowed to flood during high water to take pressure off the levees. Farmers would have to be willing to sell. The farm could be used to grow crops during dry years. A spokesman for the Corps, Bob Anderson, says the Corps learned much after the great flood of 1993, a little more two years later during the flood of 1995 and even more this year. He says the main lesson brought home in dramatic fashion this year was to watch the Mississippi River tributaries more closely. Anderson says they swelled to a point that caused the Mississippi to rise much faster than anticipated. That made it difficult to know where to station volunteer sand-bagging crews to keep the river from overflowing into homes and businesses. Anderson says the $3.7 billion price tag might seem steep, but is worth it to prevent the widespread damage that occurred this year. Flooding along the Mississippi in Iowa, Illinois and northeast Missouri caused $15 billion in damage, nearly as much damage as caused by the great flood of 1993. Anderson reaches even farther back in history to make the case for the investment. He points out that extensive work along the lower Mississippi basin took place after the great flood of 1927, which killed 500 people. Anderson says that tragedy woke up Congress to the danger extreme flooding posed. An emergency worker at Winfield says the volunteers and workers there have responded admirably, despite the crushing news this morning that floodwaters breached the last in tact levee in Lincoln County. Brad Farber is coordinating the American Red Cross emergency response in Lincoln County. He spoke with the Missourinet from the 24-hour emergency shelter the Red Cross has established at Winfield High School. Farber says the breach came as a surprise to many as a massive sandbag effort had kept the Mississippi River from overrunning Winfield, as well as Old Monroe. The National Guard had responded and teamed with volunteers to shore up the Pin Oak levee. The Pin Oak was actually the secondary levee, pressed into front-line service when the primary levee was overtopped and breached days ago. Floodwaters breached the levee at the south end, according to the Army Corps of Engineers at about 5:20 Friday morning. The Corps states the levee sustained water levels higher than it was designed for and for a much longer period than anyone had hoped. The breach came as the Mississippi was finally reaching a crest and was expected to stabilize over the weekend before slowly receding. Farber says residents are holding their breath, now relegated to becoming spectators, watching to see where the floodwaters flow. The floodwaters threaten between 100 and 120 homes in Winfield. It appears they might not make their way to Old Monroe as first feared. Despite the breach, Farber says morale remains high among the volunteers and workers. He says it seems that the worst of times brings out the best in people. Floodwaters along the Mississippi River keep the pressure on battered levees, with tension rising among those working non-stop each and every time it rains. Brad Farber, supervisor of the St. Charles County American Red Cross Service Center, says much work has kept a vulnerable levee at Winfield in tact. Farber says it is believed the Pin Oak levee will hold. The Pin Oak levee is the secondary levee in Winfield, pressed into service when floodwaters broke through the primary levee. It is protecting about 100 homes. The US Army Corps of Engineers has been keeping a close watch on the Pin Oak levee ever since. Members of the National Guard have been helping volunteers pile sandbags on the levee to help it hold. The National Weather Service has left unchanged its prediction the Mississippi River will crest late tomorrow or Saturday at 37.5 feet at Winfield. That would be just over two feet below the record flood of 1993. Even once the river crests, it will remain at 36 feet for a few days before it drops slowly, keeping a lot of pressure on the levees protecting Winfield, Clarksville and Elsberry. Work by the National Guard is credited for saving a mobile home park in St. Charles. A sandbag operation fortified a levee north of the park. National Guard members have been deployed to West Alton to fill sandbags there. Officials have called for more volunteers to fill sandbags for the West Alton levee. The Red Cross is asking for donations. The national disaster relief fund has been nearly depleted from response to major disaster this year. The Mississippi River is falling along most parts of northeast Missouri, but another levee has failed and others are causing concern. Relief has come to many along the Mississippi River as the level of the river slowly drops. The Army Corps of Engineers though cautions against letting up in the battle to protect communities. The Elm Point Levee was overtopped early Tuesday morning. The Mississippi poured over the levee and finally broke through, sending floodwaters over a soccer field and sod farm. It appeared the floodwaters would overrun a mobile home park, but it stopped short of endangering the homes. Nicole Dalrymple with the Corps office in St. Louis says members of the National Guard and volunteers attempting to help the levee hold got out of the area in time. No one was injured. Dalrymple says floodwaters have begun to recede, a bit. The Mississippi has crested along many communities in northeast Missouri, but not all. That might not come until tomorrow or even later this week. The secondary levee protecting Winfield remains a concern. It has held after floodwaters topped and broke through the main levee. The St. Louis District of the Army Corps of Engineers , which covers Hannibal south to St. Louis and below the city reports that 12 levees have failed. Many of them are agricultural levees. Many of them are private. The Rock Island District of the Corps has jurisdiction north of Hannibal, covering the cities of West Quincy, La Grange, Canton and Alexandria as well as cities in Iowa and Illinois farther north. The Rock Island District reports 13 levees in its district have failed, six federal levees. The flooding has been must worst in the Rock Island district. Army Corps of Engineers water levels . Northeast Missouri is finally getting some relief as the floodwaters begin to back off. 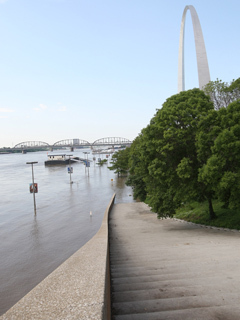 Dave Busee is the Chief of Engineering and Construction for the Army Corps of Engineers , St. Louis District, and says that many people concentrate on the danger when the river is rising, but the threat doesn’t disappear once the river falls. The Mississippi River, fat from heavy rains that soaked Iowa, has finally crested at many points in northeast Missouri and is beginning to recede. It will drop slowly, according to Busee. Everyone along the Mississippi in northeast Missouri will hold their breath hoping the levees hold until the river drops. Once it drops, the Corps will move in to inspect the levees and determine the damage done by the flood. Busee says the Corps will review all that happened this spring to go over lessons learned to prepare for the next flood. 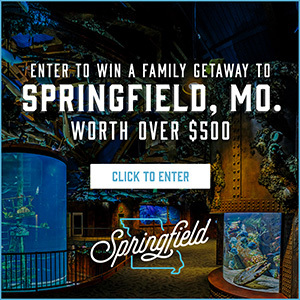 A tense waiting game is being played out in northeast Missouri. The Mississippi River, swollen from the heavy rains that saturated Iowa, laps up against temporary sandbag levees as residents desperately attempt to keep it from overflowing communities and farmland north of St. Louis. Susie Stoner, a spokesman for the State Emergency Management Agency , says a lot of concern is centered on Louisiana and Clarksville where the Mississippi is expected to crest tomorrow. Winfield has already had to endure a couple of levee breaks, with the crest there not anticipated until Monday. The National Weather Service has lowered crest expectations, mainly because the failure of some agricultural levees upriver in Missouri and Illinois has taken pressure off the downstream communities. The Mississippi is not expected to rise any more than seven feet above flood stage in St. Louis; high, but manageable. The US Army Corps of Engineers reports that 14 levees have either been overtopped or breached. Thirteen of the 14 levees are agricultural levees. The Corps reports that the Mississippi River at Hannibal dropped a foot and a half overnight to just below 27 feet, more than a foot over flood stage. The Mississippi is a foot above flood stage at Louisiana as well at 25.4 feet. The National Weather Service predicts the river will rise again this weekend, before settling back down and slowly dropping. Sandbagging continues in West Quincy, Canton, Hannibal, Louisiana, Clarksville and Winfield as residents hope to shore up levees weakened by the constant pressure of floodwaters. Volunteers have been helped by around 700 National Guard troops who have worked both to help with sandbagging and to provide security. Army Corps of Engineers daily report .